ST. GEORGE — The St. George Marathon has come around once again, marking its 39th year this weekend. Come enjoy the race, along with other events over the weekend, like the Health & Fitness Expo, the Mayor’s Walk, a pasta dinner and more. Racers and spectators alike will have plenty to do at this great event. 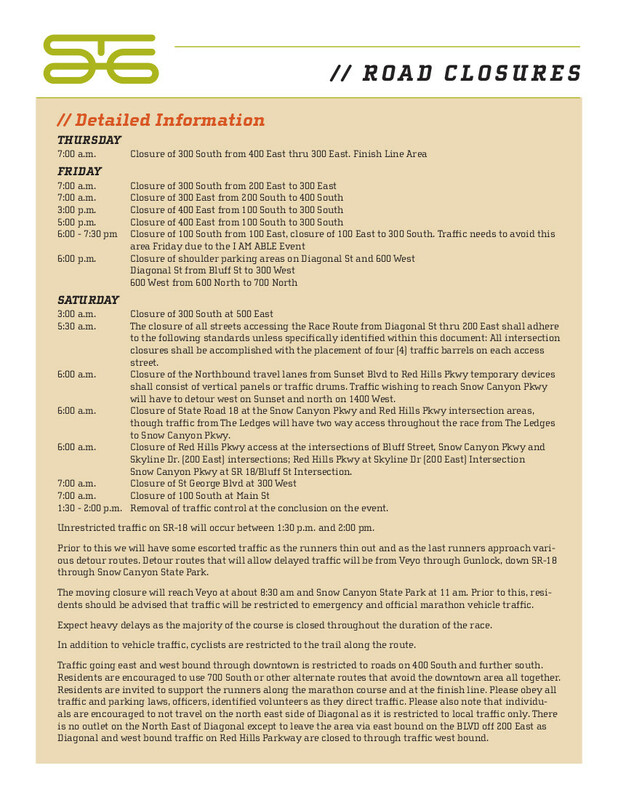 What follows is a quick guide to help Marathon-goers and others find the events taking place on Friday night, see the marathon course, identify which roads will be closed, and when, and find spots best for cheering on the runners Saturday. 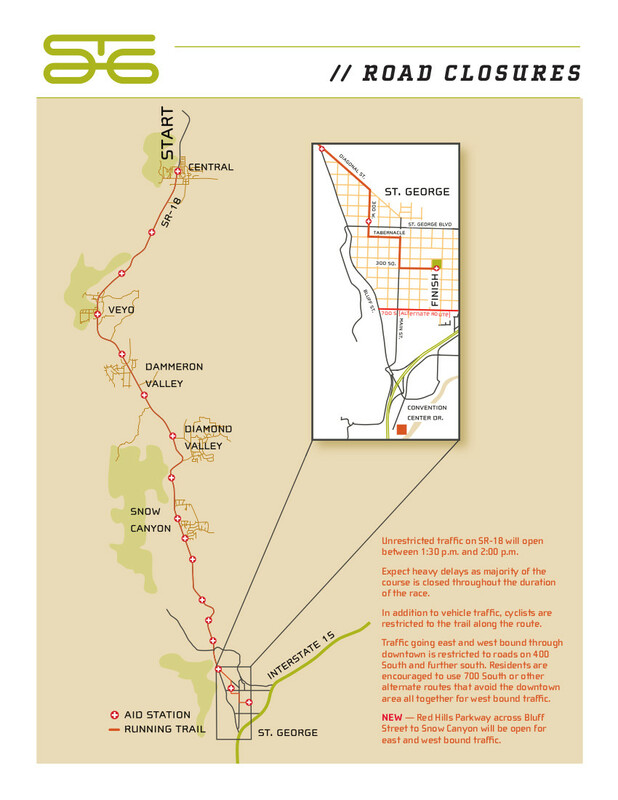 Graphics are courtesy of the St. George Marathon website. The St. George Marathon is celebrating its largest expo ever with over 85 vendors. Pick up your runner packet, bib number and runner shirt, and enjoy free health testing by SelectHealth. Mingle with other runners, attend marathon clinics, get in the spirit of the marathon, check-out what’s new in running apparel, buy your St. George Marathon souvenirs and purchase your pasta dinner tickets. Free promotional items will be given out every half hour. When: Friday, Oct. 2, from 9 a.m. to 9 p.m. This is a kids-only event, no parents allowed. Bring your children and friends to run one of two distances, 1 mile or 200 meters. If your child is under 5 years old, they may choose to run with one of the Move It! mentors. When: Friday, Oct. 2, 6 p.m.
Open to persons with disabilities of all ages. Each participant must be able to run, walk, roll or be pushed either 200 meters or 1 mile, whichever length you sign up for. Cost: $10 for teams of two. Participants may register up to 2 additional supporters at $10 per person. Includes T-shirt, and finisher’s medallion. Participants and their families will have the chance to dance with Waddles the Penguin to music by a live DJ, win prizes, play in the bounce houses, get their face painted and much more. The party will start after the races and will go until 8 p.m. The night before the marathon is turning into a big race celebration. When: Friday, Oct. 2, 6:30-8 p.m. The annual pasta dinner is located next door to the Expo. Bring your family and friends, and enjoy great food and great company. Tickets will be on sale at the Expo or at the door. When: Friday, Oct. 2, 4-8 p.m.
Join 1,200 participants in the exciting St. George Marathon experience and walk to the St. George Marathon finish line with Mayor Jon Pike, business associates, schoolmates, friends and your entire family. You may register online or at the Expo booth Friday from 9 a.m. to noon. 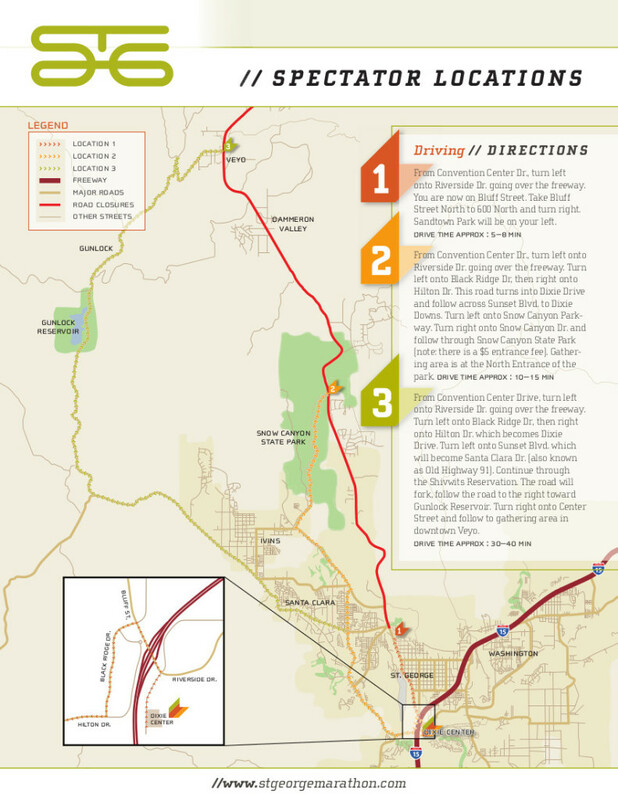 When: Saturday, Oct. 3, 6:45-8 a.m.
All runners are required to ride buses to the start unless camping in Pine Valley, staying in Cedar City or driving the alternate route from Cedar City through Enterprise. Runners board buses at Vernon Worthen Park, 250 S. 400 East, St. George, and must show bib numbers to board. Buses depart beginning at 4 a.m.